NEW YORK (AP) - The Gay & Lesbian Alliance Against Defamation is honoring Ricky Martin and Kristin Chenoweth (CHEN'-oh-wuhth). The organization announced Wednesday that Martin will receive the Vito Russo Award at GLAAD's 22nd annual Media Awards on March 19 in New York City. The award is presented to an openly LGBT media professional who made a significant difference in promoting equal rights. 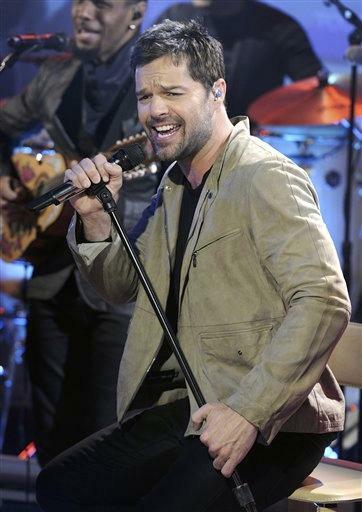 The 39-year-old Puerto Rican pop singer announced last year that he is gay. GLAAD President Jarrett Barrios called it "a game changer for many gay and transgender Latino children." Chenoweth will be presented with the Vanguard Award at an event in Los Angeles on April 10. The award is given for increasing the visibility and understanding of the LGBT community. The Emmy-award winning actress last year publicly defended gay actors' ability to play straight roles.